First, let’s quickly recap what Stadia is. Essentially, it runs games on Google’s servers, then streams them to your device of choice at up to a 4K resolution. It will work on basically any device that can run Chrome or supports the Chromecast protocol. Running games from the cloud to a device means Google can promise some pretty cool tricks—like being able to easily swap between devices, and being able to easily share game states with other people—but we’re still waiting on quite a few of the details, like how much it’s all going to cost. 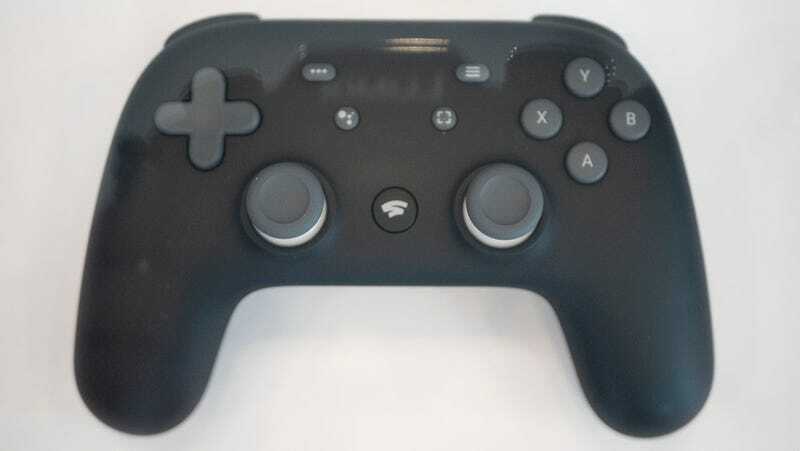 For this to work, it needs a fast internet connection and a way of minimizing lag between inputs and responses—something Google is looking to do with its own dedicated controller (it connects to the cloud directly via wifi). We’ll have to wait and see just how polished Stadia is when it finally goes live, but in the meantime, this is what it’s up against. Nvidia launched its GeForce Now platform back in 2015, and it’s still in beta—perhaps a sign of just how difficult streaming video games is. The principle is the same as Google Stadia, with Nvidia GPUs and other hardware running the games, and then streaming them to your devices over the web. Here the video is capped at 1080p at 60 frames per second, but at least it’s already live, unlike Google’s offering. For that top speed, Nvidia recommends a 50 Mbps connection and will knock the stream down to 720p for connections of 25 Mbps and under. You are limited to four hours of gaming per session however, at which point you’ll have to save the session and come back later. Originally offered only on the Shield Android TV box, GeForce Now has since been expanded to PCs and Macs—you get access to a full remote Windows PC in the cloud, where you can install any game from a selection of over 400 and stream them to another computer or a Shield. That’s on top of the original Shield package, which focuses on a more limited list of less advanced titles. Saves are handled in the cloud and enable quick swapping across different devices, and as well as the several hundred (usually older) games that come free with GeForce Now, you can also choose to bolster the selection by buying new games. Online multiplayer is supported for those games that include it. As we’ve said, GeForce Now remains in beta, and has evolved since it first appeared—like everyone else, Nvidia is still figuring out just how this game streaming stuff works. There is a waiting list to sign up, but it’s free for now until the full commercial launch happens (which might be soon, now Stadia is coming): You can access it in North America and Europe, once you reach the front of the queue. Like what the GeForce Now service has morphed into, Shadow from French company Blade gives you your very own high-powered Windows 10 machine in the cloud—but in this case you can use it for video editing and other intensive tasks, as well as gaming, and Blade says it’ll work with an internet connection as slow as 5 Mbps. It’s basically a remote desktop setup, with a 720p, 60 fps stream the maximum you can get on a 5 Mbps connection (15Mbps is recommended for the best experience, especially if you’re gaming, and with faster speeds higher resolutions of 1080p and 4K are possible). Blade says Shadow uses a secret AI sauce to predict problems in connectivity ahead of time, and make adjustments accordingly. Pay month-to-month, and Shadow costs $30 for the first month and $35 a month thereafter; stump up for a year at once, and it works out to $30 per month. If you need other stuff besides gaming, then it may be the best option out there at the moment: The service is available in selected regions in the US, as well as the UK, France, Switzerland, Belgium, Luxembourg, and Germany. In terms of the features you get, it’s just like having a Windows 10 PC in front of you, although we’ve noticed a few limitations (using VPNs is discouraged, for instance, and mining cryptocurrency isn’t allowed either). The Shadow app runs on Windows, macOS, Android (including Android TV), and iOS. Most recently, and perhaps most pertinently when it comes to Stadia, Blade launched the $140 Shadow Ghost: A set-top box that focuses exclusively on the gaming aspect of its service. Instead of using the app on a computer or phone, you plug the Ghost straight into your TV, attach a controller, and get going. The big two players in consoles, Sony and Microsoft, won’t have been at all blindsided by Google’s Stadia unveiling—despite the question marks over bandwidth and latency we’ve got today in 2019, streaming seems to be the future (or at least part of the future) for gaming going forward, and Sony and Microsoft aren’t going be caught out. Indeed, it’s Google playing catch up. Sony’s PlayStation Now subscription service has been streaming games since 2014—albeit a limited number of games to a limited number of devices. Today, you can stream games to a PC (through a dedicated app) or a PS4, and use your DualShock controller for an input device, with streaming resolution capped at 720p (Sony says a minimum 5 Mbps connection speed is required). Multiplayer is available too. At the time of writing, you can pick from over 750 titles from the PS2, PS3, and PS4, and the selection continues to grow. The emphasis is on older titles rather than new AAA blockbusters, but some PS4 games can be downloaded and played locally if you don’t trust your broadband connection. PlayStation Now costs $20 a month if you pay monthly, $45 if you pay for three months in advance ($15 a month), or $100 for a year (a little over $8 a month), with a free trial available. The service is live in the US, Canada, the UK, Japan, Austria, Belgium, France, Germany, Ireland, Luxembourg, the Netherlands, Switzerland, Spain, Italy, Portugal, Norway, Denmark, Finland, and Sweden right now. Online multiplayer is available as normal for the games that support it, and you can switch between titles on PlayStation 4 and a separate Windows machine. It feels like a more cautious, limited attempt at what Google is trying (it did once support more devices, including Bravia TVs, but has now been scaled back). The service has its critics and isn’t always reliably stable, but it’s more or less what you would expect from a company with an established gaming business that wants to test the waters with something new. And what then of Microsoft’s Project xCloud? From what we’ve heard so far (which isn’t all that much), it sounds very Stadia-esque. “Our vision for the evolution of gaming is similar to music and movies—entertainment should be available on demand and accessible from any screen,” wrote Microsoft’s Kareem Choudhry back in October. Promising “state-of-the-art global game-streaming technology” when it eventually arrives, Project xCloud is going to put Xbox games in the cloud without any extra work needed from the developers, so it’s already got one advantage over Stadia. Of course, Microsoft already has plenty of experience in console and server building to draw on too. Public trials are starting this year, Microsoft says, with input provided by Xbox Wireless Controllers or “game specific touch input overlay” for some titles on mobile. The company has also revealed that private testing is working over connection speeds of 10 Mbps, so it might not be as demanding in terms of bandwidth as Stadia. With its existing cloud and gaming services—Azure, Xbox, and Windows—Microsoft might be best placed to take on what Google is offering. We don’t know how much Project xCloud is going to cost, or when and where it’s going to be available, but it sounds like it’ll tie in quite closely with the $10/month Xbox Game Pass. We’re still waiting to hear more on features, pricing, availability and so on, but expect to hear a lot more when E3 rolls around in June. Like Sony, for the time being Microsoft will be supporting both traditional gaming and the streaming future. It is talking about keeping the Xbox console as a “flagship experience” while at the same time providing an experience that works on any device (like Office or Skype).